Microsoft’s new video game console, the Xbox One, will not require users to keep the Kinect sensor plugged in for the system to work. …like online, the console will still function if Kinect isn’t plugged in, although you won’t be able to use any feature or experience that explicitly uses the sensor. When Microsoft first announced the Xbox One in May, it said the Kinect, which includes cameras and microphones that are always on and listening for commands, needed to be plugged in and switched on in order for the console to work. 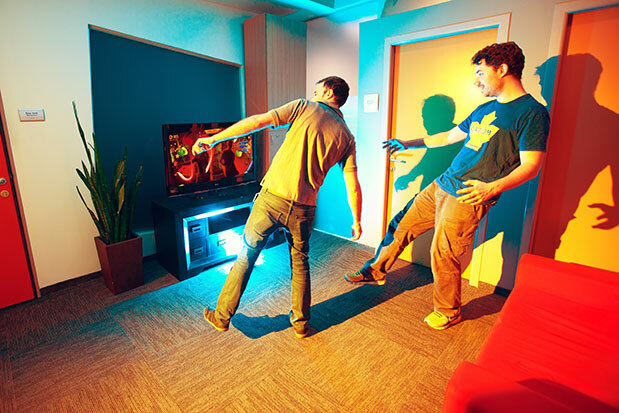 However, users would still have the option to disable the Kinect in the console’s settings menu. But Microsoft still said the Kinect sensor had to be plugged in for the console to work, even if it was disabled, fueling concerns that the device could be used to spy into people’s living rooms. It now appears Microsoft has changed its mind and will allow you to use the Xbox One if the Kinect is unplugged from the console. 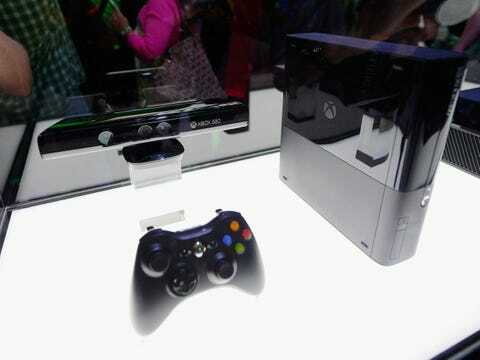 This isn’t the first 180 Microsoft has made since announcing the Xbox One. 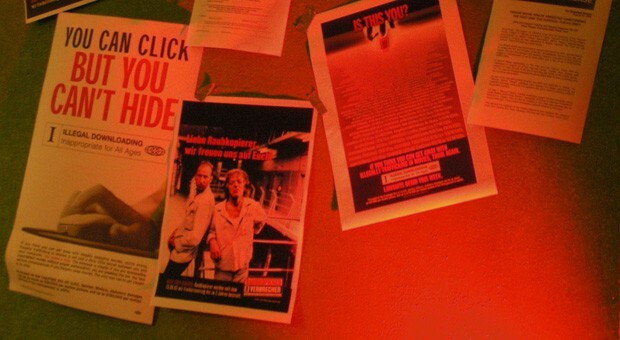 Originally, Microsoft said the console required an Internet connection to work in order to check whether or not users were playing pirated games. Microsoft also said it would allow game publishers to essentially “lock” a purchased game to one Xbox, making it difficult to trade in or buy used games. After a huge user backlash, Microsoft reversed both policies. 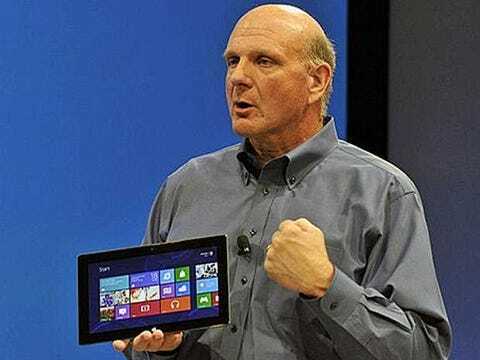 Here’s another discouraging bit of news about Microsoft’s Surface tablet. According to the company’s 10-k, it only did $853 million in sales from the Surface between October of last year and June of this year. 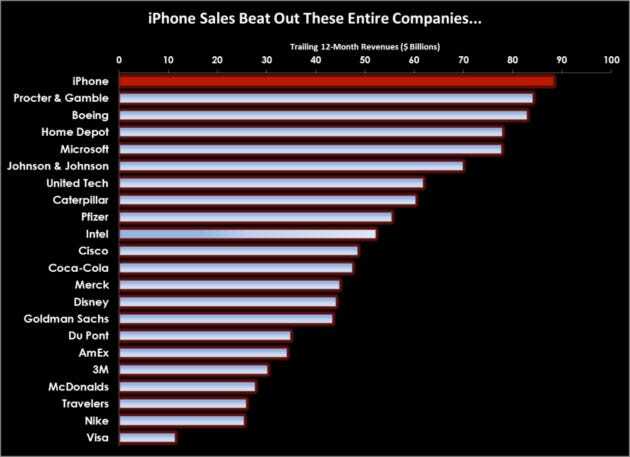 It’s not exactly a fair comparison, but over the same time frame Apple did ~$25 billion in iPad sales. Microsoft’s Surface was an attempt to create a strong Windows brand, while at the same time combating the rise of the iPad. It has failed on both counts. Microsoft had to slash the price of the Surface RT by 30%, which led to a $900 million charge. We don’t know how many units of the Surface Microsoft has sold. We can do our best to guess, though. If the average selling price is $650, then Microsoft sold 1.3 million units. Over the same period, Apple sold 56.8 million iPad units. Microsoft is not giving up on the Surface, though. It says it remains committed to the tablet, and is likely to introduce a next generation version of the product in the coming months. Microsoft’s stock was clobbered today, falling 11.4%. The most obvious reason for the decline: The collapse of the PC industry has finally hit Microsoft’s earnings. Windows operating income fell by over 50% on a year-over-year basis. 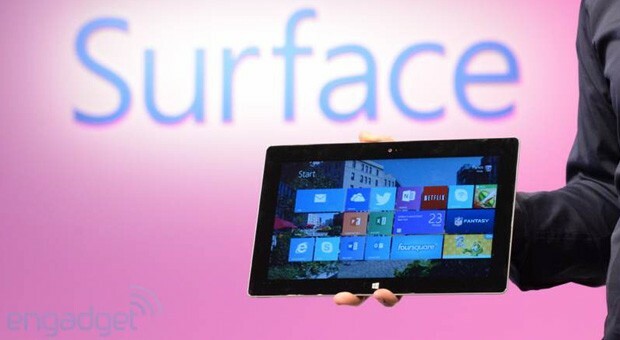 It took a $900 million charge for inventory of its Surface RT tablet. 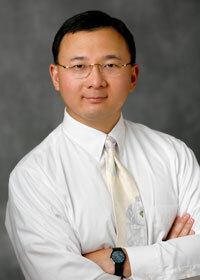 Its CFO admitted that it’s going to take a while for tablet sales to offset the decline of the PC. 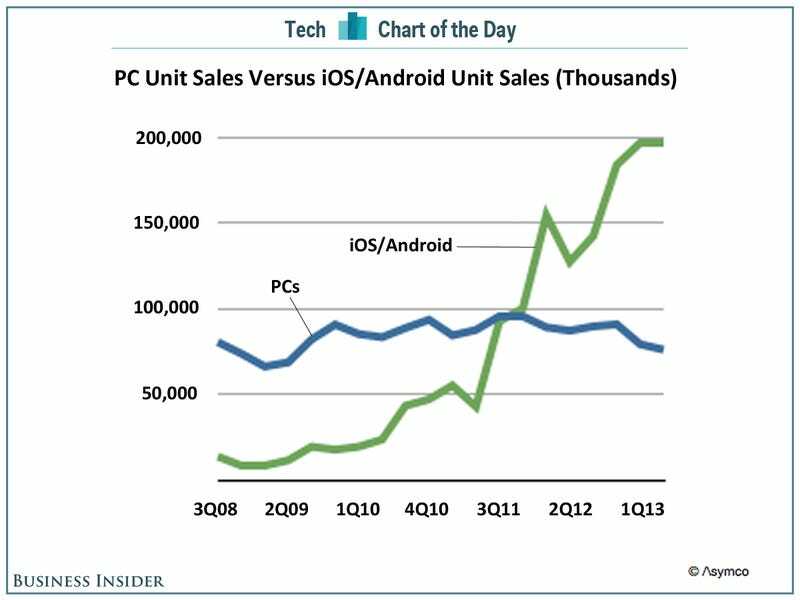 Few charts illustrate what’s happening to the PC market, and thus, what’s happening to Microsoft, better than this one from Horace Dediu, independent analyst/blogger at Asymco. Microsoft’s monopoly over our computing is dead. 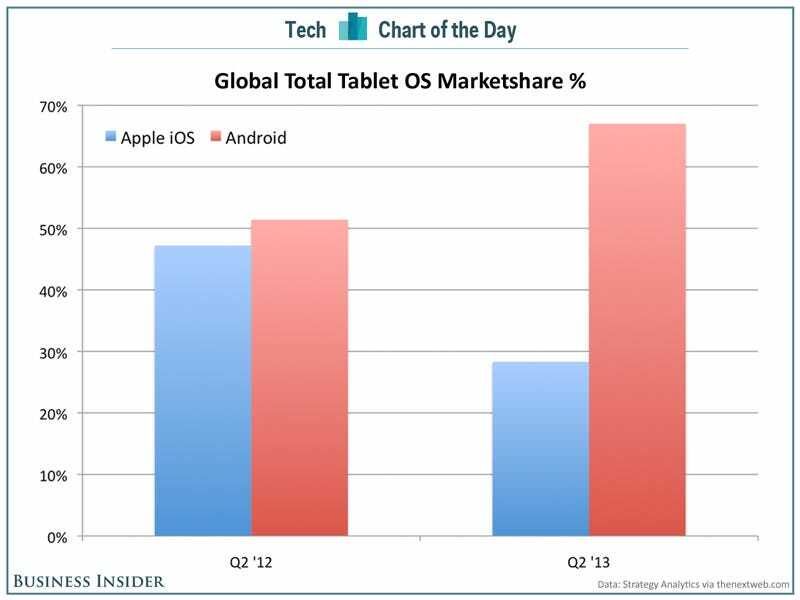 Combined iOS/Android unit sales are outpacing PC sales 2.6 to 1. Microsoft is down 8% pre-market this morning. The stock has been doing worse and worse since the company released earnings. Initial reaction to the release sent the stock down 2.5%. Then it was 5%, then 6% … and now it’s down 8%. Microsoft’s Windows business is finally feeling the effect of the collapse of the PC industry, and the failure of Windows 8 to slow the iPad. Israeli news source Calcalist has a decent track record when it comes to acquisition gossip, even if the gossip itself sometimes comes to nothing. 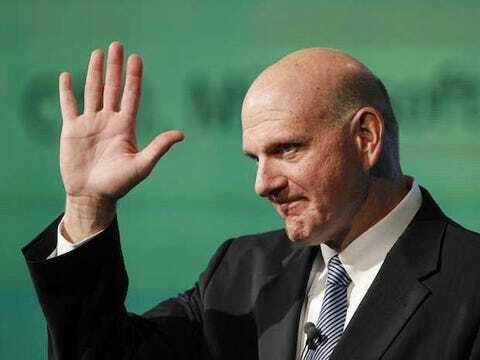 Bearing that in mind, the latest rumor is that Apple is “in talks” to buy PrimeSense, the company that worked with Microsoft to create the first-generation Kinect (but not Kinect 2.0) and which could potentially help Cupertino with new projects that require natural interfaces. The value of the acquisition is said to “probably” be around $280 million, although the source makes it clear that these talks are in very early stages. Whichever way things go, the immediate effect of a report like this is to add to the impression that PrimeSense has a future beyond the Xbox 360 — but, frankly, we already believed it did. For the first time since October 2012, the iPhone failed to notch a monthly gain in U.S. smartphone market share, standing unchanged at 39% at the end of May, according to comScore. That’s up from 32% a year prior. Android eked out a minor gain, finishing May with a 52% share of the U.S. smartphone market, up slightly from 51% a year prior. Despite the relatively flat market share growth, the broader expansion of the U.S. smartphone market means Android still has 17 million more U.S. users than it did a year before. The iPhone picked up 19 million users in the 12-month period. Windows Phone continues to show no growth in the U.S. market, with only a 3% share. It actually has less users than it did a year ago, and that was before the release of Windows Phone 8, Microsoft’s latest attempt to launch a popular mobile operating system. 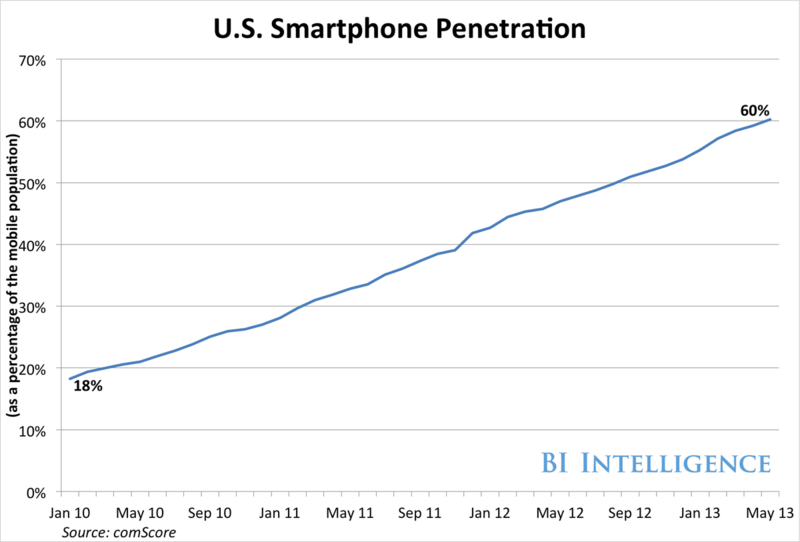 Overall, U.S. smartphone penetration tipped past 60% for the first time, with 141 million Americans owning smartphone at the end of May.